In the mid-80s, Kerr Foundation trustees recognized that Oklahoma agriculture was in crisis. Environmental and financial problems on the farm needed to be addressed with fresh ideas that emphasized long-term solutions. So in the best Oklahoma pioneering tradition, the organization made a fresh start, reorganizing as the Kerr Center for Sustainable Agriculture. By adding the word “sustainable” to the organizational name, the Kerr Center joined the search that is going on worldwide for new farming practices and better marketing and food distribution structures. It is generally agreed that a sustainable agriculture will preserve our natural resources, protect our natural environment, and improve the quality of life for farmers and ranchers. The result will be strong, resilient rural communities that will be a source of strength for the nation as a whole. (Read the Kerr Center vision statement, mission, and core values). In 1989, a group of farm managers, ranch workers, and researchers headed by Kerr Center president Jim Horne collaborated on guidelines for evaluating both the economic and ecological sustainability of the Center’s projects. The creation of this canon of concerns was certainly a first in Oklahoma and was a significant contribution to the national debate on just how to make farms and ranches sustainable. 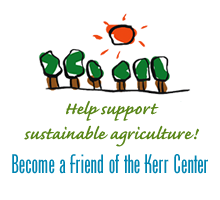 Horne’s activities have helped keep the Kerr Center in the forefront of the sustainable agriculture movement. He was part of a small group that testified before Congress on behalf of what would become the Sustainable Agriculture Research and Education (SARE) program. He then served as head of the administrative council for SARE’s southern region for two terms, a voluntary position. Horne also served on the sustainable agriculture task force of President Clinton’s Council on Sustainable Development. The Center continued to do a variety of educational activities during its first years, including hosting field days and tours, producing a newsletter, and continuing the brucellosis campaign. The center of operations continued to be the ranch south of Poteau. However in 1986, the Vero Beach Research Station (now the independent Florida Center for Agricultural Sustainability) was established in Florida, to work with citrus, and in 1990 the Kerr Angus Ranch was established near Coyle, Oklahoma, to work with livestock. Meadowcreek in Arkansas was affiliated with the Kerr Center as well. The emphasis was on research and demonstration projects. After all, how could specialists advise farmers about how to make their farms sustainable if they hadn’t done it themselves? Some projects included multi-species grazing with sheep, cows, and goats, trials of berries and other horticultural crops, weed control with geese, crossing-breeding cattle for the hardiest, most efficient cattle on grass, Neem oil and biopesticides for citrus, use of draft horses, production of alternative crops such as shiitake mushrooms, sweet sorghum, and Christmas trees. Field days were held periodically and a series of Progress Reports, describing the center’s projects, were published. From 1991-2010, the Kerr Center operated the Overstreet-Kerr Historical Farm. Located ten miles south of Sallisaw, Oklahoma (home of John Steinbeck’s Joad family in The Grapes of Wrath), the restored 1895 home and farm showcased farm life and agricultural practices before World War II. The farm is listed on the National Register of Historic Places. For almost twenty years visitors were treated to tours of the beautifully restored 14-room home, saw original farm buildings and display of antique farm equipment. They also learned about heritage breeds of livestock and poultry, heirloom variety fruit trees, and could picnic under the trees. The annual Fall Farm-Fest every October was a highlight of the year, with thousands of schoolchildren and local people attending.